Prayagraj, February 11: The festival of Basant Panchmi was celebrated on Sunday with whole enthusiasm, spirituality, and positivity. It is celebrated as Saraswati Puja on Panchmi of Shukla Paksha in the month of Magh. On the occasion, around two crore devotees took a holy dip during the third and final Shahi Snan at the Kumbh Mela in Prayagraj. Mela authorities said the devotees were still at Sangam, the confluence of Ganga, Yamuna, and Saraswati. Elaborate security arrangements were made for the Shahi Snan. To make the occasion more graceful, flowers were showered from the sky by a helicopter. Without any casualty or any other happenings, the occasion got completion tag with safety. “About 1.50 crore people had taken dip till 3 pm. Close to 50 lakh devotees had already taken a dip before sunrise. 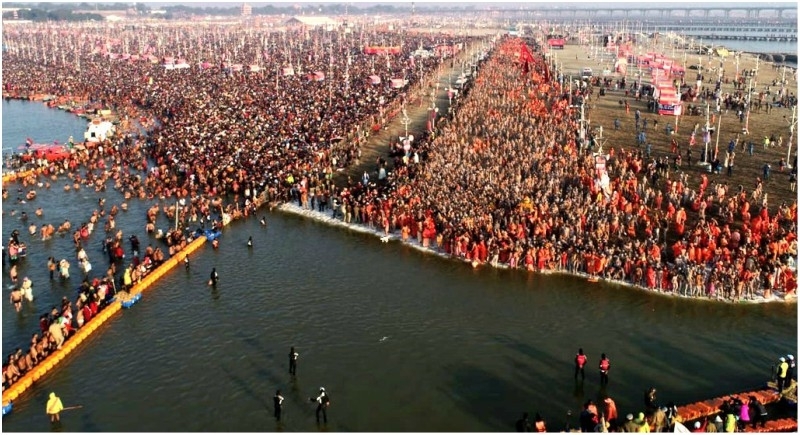 Around a crore devotees had taken the holy dip in Sangam on Saturday itself,” said Vijay Kiran Anand, Kumbh Mela officer. Choppers were also used for aerial monitoring of the Kumbh Mela area. President Ram Nath Kovind and Prime Minister Narendra Modi also greeted the people on Basant Panchami. In West Bengal, Saraswati Puja is being celebrated with traditional fervor. The idol of Saraswati, the goddess of learning, is worshipped in every household, particularly an educational institution.